Lock in a great price for Traditions at the Glen Hotel and Spa – rated 8.5 by recent guests! There's a safe if you need that. 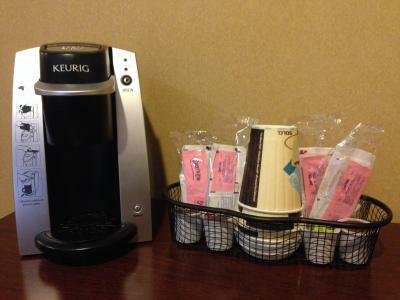 There's a Keurig in the room, if you like those. I didn’t eat breakfast at traditions. I did have dinner with my parents in the dining room. The food and service were both excellent. I stayed for one night as a birthday splurge and got upgraded to a suite! The bed was comfy, and I appreciated the view and spa discount. Spa soaps in the room are a nice touch as well, as is free WiFi. Honestly, the room was a little small. But it was clean and the beds were comfortable and clean. The bathroom was stocked with the lovely soaps and lotions and hair products that are used in the spa. Yum! The staff was so accommodating and professional. We did use the spa for the salt room. Such a nice experience. Staff was very welcoming. Coffee and hot chocolate upon check in. The breakfast was good- kids eat free. The staff was very helpful. The propert has a spa and a salt sanctuary. We checked in too late to take advantage but should we choose to come back, we will definately book a service or sit in the salt room. Bar and restaurant were pleasant for drinks although we chose not to eat there. Concierge was welcoming and very helpful. Everything. The hotel was awesome the staff also. Golf course right outside the door. Nature park. Convienient to the city. Stores and restaurants. Awesome place going back again in 2 months. Great trails with beautiful scenery on the property. Traditions at the Glen Hotel and Spa This rating is a reflection of how the property compares to the industry standard when it comes to price, facilities and services available. It's based on a self-evaluation by the property. Use this rating to help choose your stay! Featuring an 18-hole golf course, this New York resort features meeting facilities, on-site restaurant, and full-service spa. Oakdale Mall is within 2 miles of the hotel. 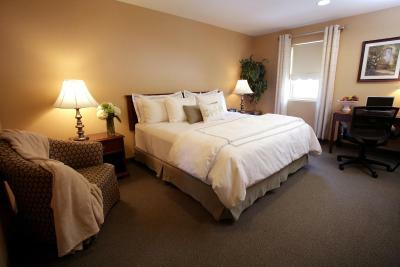 A flat-screen cable TV, alarm clock, and desk are featured in each room at Glen Resort. Coffee-making facilities are also included. Access to free Wi-Fi and a 24-hour business center are provided to guests throughout their stay at Traditions at the Glen Resort and Conference Center. A library and on-site beauty shop are offered as well. A continental breakfast is offered Monday through Saturday, and a breakfast buffet is available on Sunday. The Tavern serves traditional American cuisine for dinner. The State University of New York at Binghamton is 4 miles away. 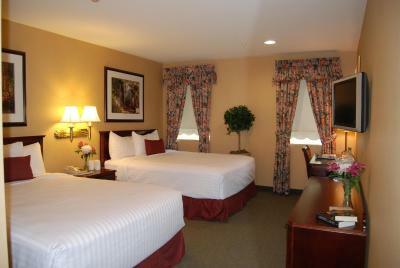 Greater Binghamton Airport is within 20 minutes' drive of Traditions at the Glen Resort and Conference Center. When would you like to stay at Traditions at the Glen Hotel and Spa? House Rules Traditions at the Glen Hotel and Spa takes special requests – add in the next step! When booking more than 25 rooms, different policies and additional supplements may apply. Traditions at the Glen Hotel and Spa accepts these cards and reserves the right to temporarily hold an amount prior to arrival. 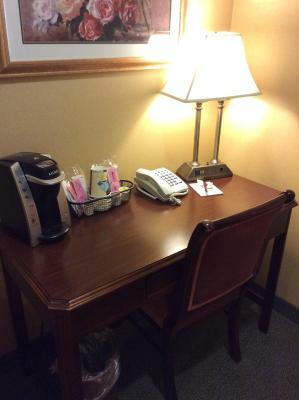 Guests can request a microwave or small fridge for their room at an additional charge. The room was pretty clean, but not totally clean. I could tell this from the shower and there was a bottle cap underneath the desk (so I knew they didn't look/clean there as well as they should have). A microwave and refrigerator did not come with the room (I paid $179, for the room, with tax). There was an additional charge for those items, which I did not inquire about, so I do not know what the charge is, but most rooms come with these items at no additional cost. The ironing board was quite dirty/stained and should be replaced. Older facility that could use a lityle updating. Well managed and very clean. We extended our stay 1 additional night. The front desk kindly accommodated an additional night in the hotel.... however we had to change rooms and the second night we were apparently directly over a reception room or band room. Very noisy. I will ask next time to make sure that we are not in that area if the hotel. I’m not complaining about being upgraded to a suite, especially one with a deck, but I lucked out on this the first real hot day of the season and the wasps kept me from fully indulging in the deck. Furniture is older and not as functional as newer furniture would be, but it’s older with the point of fitting with what would be original at the time the hotel was a house. Continental breakfast was an additional $10.50 so we did not take that. Coffee in the lobby was Keurig; not a fan so would have liked fresh brew. It still was a great environment. We rented a suite because we were traveling with kids. The rug in our room was very old and room smelled like something died. The pullout couch was extremely uncomfortable- i should have asked for a refund. The rooms need updating. Only one regular coffee in room - we had to split it. Shower gel was empty When we checked in, we were told we could purchase breakfast the next morning for $10. The breakfast was what you get for free at Hampton Inns or other discount hotels. Would expect more from a $200 room. No complementary Sunday breakfast. Complementary coffee was a Kerig and not fresh brew. There was a Kerig in the rooms so that was good. Road signs. Other than that absolutely nothing. Loved it!! !